Now that the “regular season” is over in League 1, here are the final set of scatter graphics. These compare the attacking and defensive performance of each club: they are explained here if you haven’t seen them before and the previous instalment is here. Graham Westley set Peterborough an incredibly ambitious target of taking 25 shots per match when he took over and, while he fell just over 10 short, they did out-shoot the rest of the division. 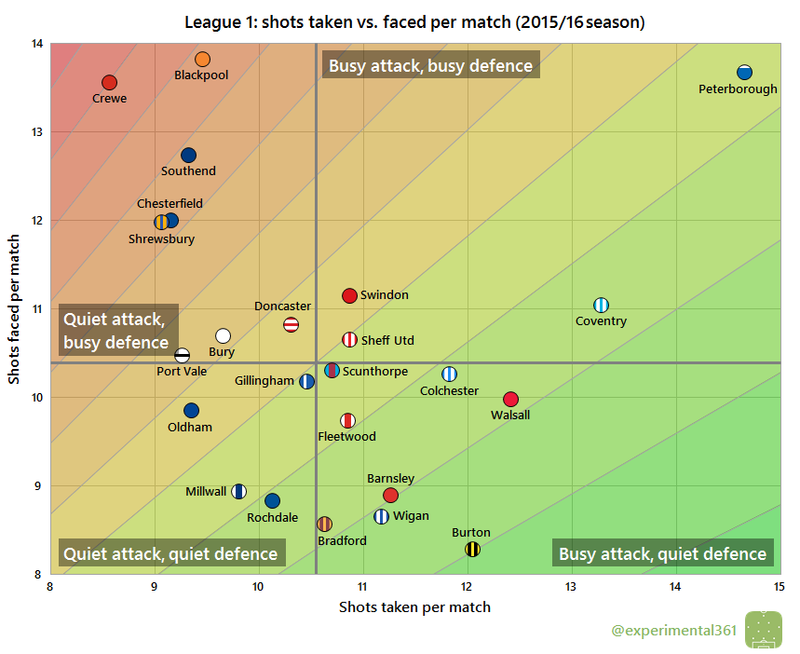 Unfortunately they faced almost as many shots in return – only relegated Blackpool allowed more. Burton were the most dominant side overall and therefore look to have merited their second successive promotion. 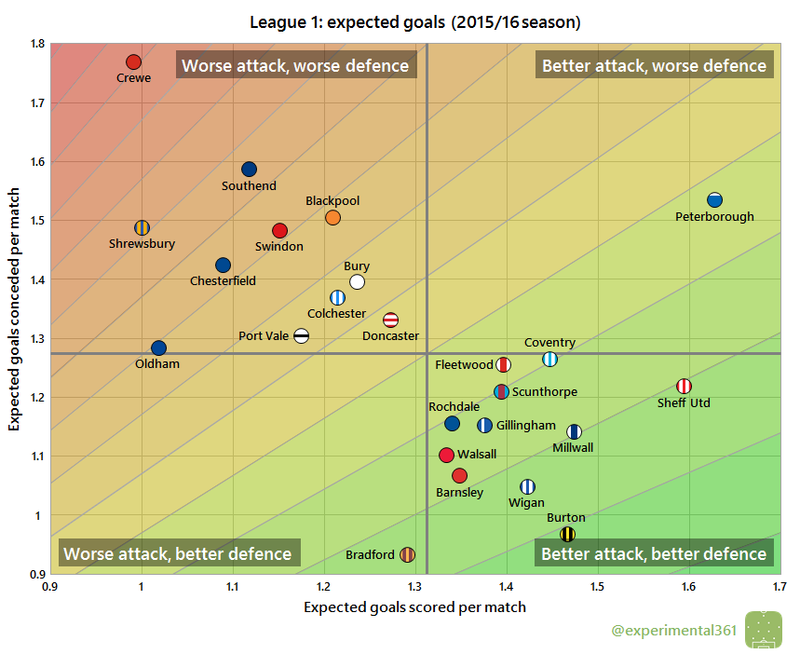 What’s interesting is that Colchester are in the same bottom right quadrant despite ending the season at the other end of the table – the next few charts will help to explain why. In the top left we can see that it’s been a horrible season for Crewe, who took fewer shots than anyone else and allowed one of the highest totals in return. While Coventry took more shots than anyone except Peterborough, they were also among the more wasteful sides at turning their efforts into goals. Promoted Burton were more wasteful still, with both significantly less ruthless than champions Wigan or Millwall, who were the sharpest in front of goal. We can see that Colchester are very close to the Brewers on this chart – in fact they scored the same number of goals this season. Here’s where Colchester‘s season went wrong: it took fewer than five shots to score a goal against them on average, which is far fewer than any other side. Scunthorpe faced a similar number of shots but soaked up over twice as many for each goal conceded. They may have ended up missing out on a play-off place, but Coventry operated the division’s most resilient defence, narrowly edging that of Burton. The Brewers owe promotion to their back line: not just its resilience but how few shots they allowed their opponents too. 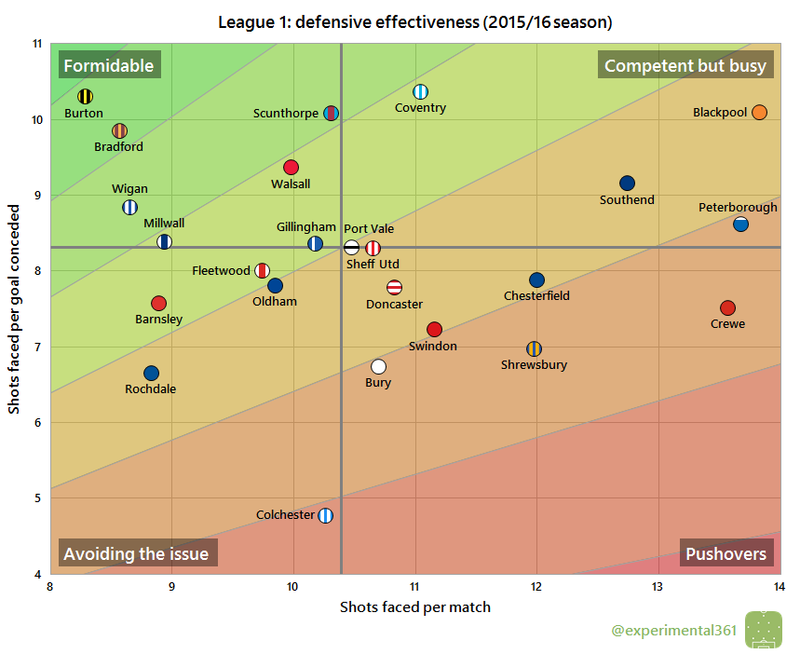 When we correct for shot quality like this, Crewe‘s relegation unfortunately looks even less surprising. It’s interesting that the next most permissive defence was that of Southend, who spent much of the season in the top half of the table. 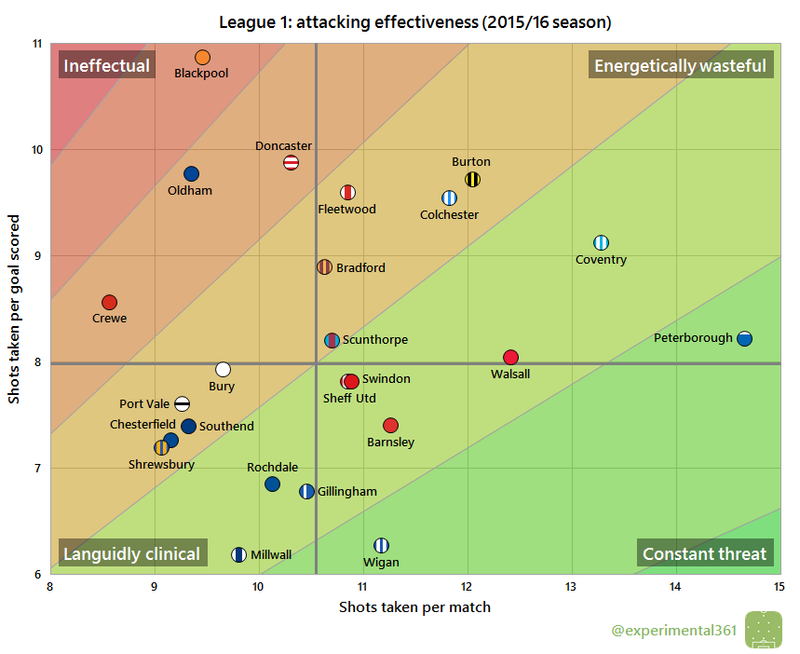 Peterborough are alone in the top right quadrant: they were the most dangerous side in the division going forward but few looked more vulnerable at the back. Fleetwood‘s brush with relegation is surprising given that they look to have performed slightly better than average overall. If they can maintain the same level next season then it’s likely that they’ll finish higher. Note: it’s my aim to expand on this with a club-by-club review of the season for all three Football League divisions (and the National League if I get time) in the coming weeks.